Jonathan was interviewed & contributed to the article about collecting vintage watches, cars & pens in Singapore. This is a financial newspaper for businessmen and professionals with about 100,000 readership & sold in the region. We are recommended as a good place to shop for watches in Singapore. This is a HK based financial newspaper about the Asian market & sold throughout the world. Jonathan was interviewed & featured in a financial Newspaper article "The Annual Watch Supplement" for businessmen and professionals with about 100,000 readership & sold in the region. We’ve got readers who read our article from Shanghai to Manila! It was a three pages, full-coloured spread. Our company was featured in the "Life" section in a local mainstream English newspaper. Jonathan was featured in a local regional English weekly newspaper. Jonathan was interviewed & featured in an article about watch collectors in Singapore. Jonathan was interviewed & featured in an article about the secondary watch market in Singapore. “NTUC lifestyle” magazine in a feature story. It's the largest circulated magazine in Singapore. A bi-annual watch magazine published in Singapore & Malaysia. Featured Jonathan & his company, Passions with the new gallery layout. It was a three pages feature. We are mentioned as one of the reputable watch dealer in Singapore in an article "Second Hand Roses" pg46-54. We were featured & mentioned in an article "Investment: Buying into Time" pg124-130. A local Chinese newspaper article on lifestyle products. 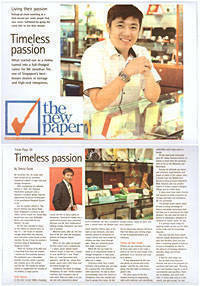 We are interviewed & introduced to the readers as one of the reputable watch dealer in Singapore. Jonathan was interviewed & featured the new gallery in an article about 2nd hand watch market. Jonathan was interviewed & contributed to the article about collecting vintage watches in Singapore. This is a magazine dedicated to the high social society in Singapore & this is a special annual publication "Tick Talk" on watches. Our company was featured in this hardcover book that's distributed to more than 20,000 rooms in the local hotels during the WorldBank Convention. October 1997, Jonathan was invited to give an exclusive talk on a 30 minute programme. 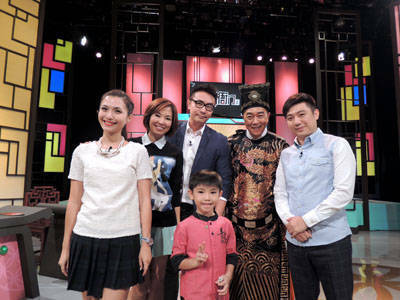 It was aired over the cable network in Asia. Our clients saw this in Singapore, Hong Kong, Tokyo & Jakarta! May 1999, Jonathan was interviewed in a local Mandarin programme “Afternoon Delight” & featured Jonathan’s watch collection & business. Late 2001, Jonathan was interviewed in a local English programme about investment & featured Jonathan giving advises for collecting watches. Early 2002, Jonathan was interviewed in an English programme “I, the collector” about collectors & their passion. Jonathan had an exclusive interview about his passion in horology which featured his vast collection of watches & horological publications. This programme has been shown several times since. Aug 2004, Jonathan was selected to represent "Martell Lifestyle" campaign. A programme about people appreciating finer things in life. This documentary was shot in HD (High Definition) and in those days this was a costly production using very expensive equipment. 14 June 2007, Jonathan was interviewed in the programme "Smart省钱王 (King of Thrift 2)" . It featured our company & our products that offer value for money. 22 Aug 2008, Jonathan was interviewed in the programme "黄金年华 Golden Age ( 资讯节目Info/Education )" & featured some of our watch collection. "识货衙门" to share with the public on how to authenticate Panerai watches.